HairMax Laser Devices – How it Work? HairMax Laser Devices – Does They Really Work? HairMax Laser Devices works best for people with mild to moderate hair loss or thinning and wants to regrow lost hair, and prevent further hair loss. These devices are used for both men and women 18 years or older. HairMax is the pioneers in home use laser technology for hair growth. Since its inception in 2000, HairMax by Lexington International has exceeded its commitment to innovation by continually expanding its laser devices product line and developing hair care products and nutritional supplements to complement the laser treatments. Their more than two decades of research and development efforts resulted in the creation of a low-level laser therapy medical device. HairMax Laser Devices are the First FDA Cleared home-use medical devices. In addition, they are safe, effective and easy to use hair loss treatment. Also, these laser medical devices effectively promote hair growth and treat hair loss in both men & women. Keep reading to know more about HairMax Laser Devices Review, Products, How it Works, Side Effects and more. 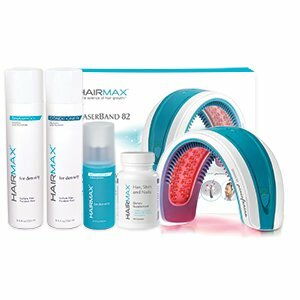 Out of HairMax’s complete line of hair care products, such as shampoos, conditioners, supplements, etc., their most popular products are the Laser Devices. HairMax Laser Devices uses low-level laser therapy (LLLT) technology to deliver laser light energy to your hair follicles. This laser energy stimulates the follicle to grow healthy new hair for pattern baldness or thinning hair. The HairMax laser devices work directly on the hair follicle, providing the needed energy to support healthy hair growth. This helps to increase blood circulation to the follicle and eliminate waste. Please note that this product is not intended for people with severe hair loss and non-functional hair follicles. Patented Hair Parting Teeth – HairMax Laser devices are the only Laser Hair Loss treatments on the market with Patented Hair Parting Teeth mechanism. The teeth part the hair to help deliver optimum laser light energy to reach the hair follicles for achieving optimal results. Laser Density – Laser diodes are uniformly and densely placed in HairMax devices. The closely placed laser diodes within the devices provide a consistent light energy distribution and uniform coverage over the scalp to deliver laser light to your follicles. No spots mean more coverage and better results. Laser Intensity – HairMax devices are manufactured with 100% medical grade lasers only and no LEDs. These lasers deliver collimated light, which travels in a straight line. This focused light from lasers penetrates the scalp to reach hair follicles. Unlike LED lights that are not collimated or focused. HairMax laser treatments work through the process known as photo-biostimulation. This process is similar to photosynthesis which causes growth in plants. HairMax Laser devices utilize Laser Phototherapy to deliver low-level laser light to your hair follicles. This therapeutic, nourishing and visible light energy in the red spectrum activates follicles at a cellular level for stronger hair growth. This treatment also helps stimulate hair growth factors, extend the growth phase of hair, reverse hair thinning, restore healthy hair’s natural growth cycle and help your hair grow with increased density, fullness and strength. HairMax laser devices are clinically proven to be effective and safe in treating pattern hair loss and promote hair growth in both men and women. The manufacturer says the best time to use the devices is the first sign of hair loss or thinning hair. This is because the earlier you start you can see better results sooner. Also, there are no reports of any serious side effects occurring upon using these devices. Users experience an average hair growth of 149 new hairs per square inch with results seen in 12 to 16 weeks. HairMax laser devices also work well with any other treatments. Million people have purchased the devices, and have no reports of harmful side effects occurring. Hence, these devices work but use them indefinitely to maintain results. HairMax brought a new Breakthrough in Hair Growth with its 4 unique models. These devices are FDA Cleared for use in both men & women. This device delivers therapeutic light energy to your hair follicles and stimulates hair growth through 82 medical-grade lasers (No LEDs). Its unique band design allows full scalp uniform coverage & maximum comfort. 82 lasers x 3 areas equals 246 total scalp coverage. Its super fast function and effective treatment in little as 90 seconds from start to finish, only 3 times a week. It comes with patented hair parting teeth technique For Maximum laser light delivery to your hair follicles. Its hands-free, cordless, sleek, lightweight Italian design by Pininfarina makes it easy to use anytime, anywhere – at home or traveling. HairMax Laserband 82 Results are clinically proven to be safe and effective in 7 clinical studies. Price $799. It features an innovative new flex-fit band design for a comfortable treatment. This design adjusts to fit most head sizes comfortably. Its exclusive hair parting teeth mechanism parts your hair during treatment to ensure maximum laser light delivery to follicles. The HairMax LaserBand 41 provides a fast, effective and easy to use treatment with 41 medical grade high-quality laser modules. Move the device over your scalp in 6 sections for 41 lasers x 6 areas equals 246 full scalp coverage. Get comfortable and fast treatment in little as 3 minutes, 3 times a week. Its hands-free and lightweight design allow you to use it at home or while traveling. Price $549. LaserBand 41 Bundle Includes HairMax LaserBand 41, Rechargeable Battery, Power Cord, User Manual – Quick Start Guide and 2 Year Laser Device Warranty, plus a free gift of 4 piece Density Hair Care Bundle. The 12 Medical Grade Lasers and no LEDs deliver targeted treatment or full scalp coverage for new hair growth. It is convenient and easy to use with treatment time as less as 8 minutes, 3 times per week. Its sleek Italian, lightweight, and portable design make it easy for storing or travel. It uses innovative hair parting teeth technology. Price $399. You will find mixed HairMax Ultima 12 Lasercomb Reviews on Amazon. Some people say it is easy to use and works effectively while for some it was annoying to use its non-functional design. It comes with HairMax Ultima 12 Lasercomb, Rechargeable Battery, Power Cord, User Manual – Quick Start Guide, 2 Year Laser Device Warranty and 4pc. HairMax Density Hair Care bundle for free. This device comes with 7 Medical Grade high-quality Lasers to energize hair follicles. Its sleek design allows full scalp coverage treatment easy. This clinically proven safe device treatment time is 15 minutes, 3 times a week. It is easy to carry and store. Affordably priced $199. There are mixed HairMax Prima 7 Lasercomb Reviews on Amazon. Some people experienced terrific results while still, some are waiting to see noticeable results. It comes with Prima 7 laser comb, Rechargeable Battery, Power Cord, User Manual – Quick Start Guide, 2 Year Laser Device Warranty and free 4pc. HairMax Density Hair Care Bundle. All HairMax laser devices deliver the same energy which is proven to effectively treat hair loss, thinning hair, and stimulate hair growth. The only difference is in the treatment time – the more lasers the shorter the treatment time. However, all devices require treatment only 3 times a week. There have never been any reports of negative side effects occurring from using the HairMax laser devices. These products are in the market for over 15 years and had undergone several clinical trials which only prove its safety and effectiveness. You will find mixed HairMax LaserComb Reviews and HairMax LaserBand Reviews from customers. Some people are happy to own these devices and share success stories Online for HairMax Laser Devices Reviews. People say these high-quality products are effective, safe and efficient to use. Some say these medical grade laser devices work for hair loss and hair thinning treatment as advertised. As against, some people complain of experiencing no visible results when used as directed. Also, some HairMax Negative Reviews are about its high price and intention of the product that only treats some types of pattern baldness and hair loss. HairMax Instructions are best followed for HairMax laser devices How to Use should be as per the method described in the particular User Manual. HairMax Warranty is for 2 Year for all Laser Devices. However, the manufacturer claims that the product may last for 10 years. HairMax Guarantee for all Laser devices is a full 5-month money back guarantee. You can use them for a full 5 months and if not completely satisfied with the results, return it for a full refund less 20% restocking fee. If you are in the early or mid stages of hair loss, wish to religiously follow the treatment plan and want to regrow hair at any cost then buy HairMax Laser Devices today. These devices are effective, user-friendly and safe to treat and help grow stronger, thicker and fuller hair within 20 weeks.